Sanabelle Hair & Skin+ delivers high quality protein packed in the gluten-free kibble with great taste. Rich in natural chondroitin and glucosamine to support and maintain bone cartilage. 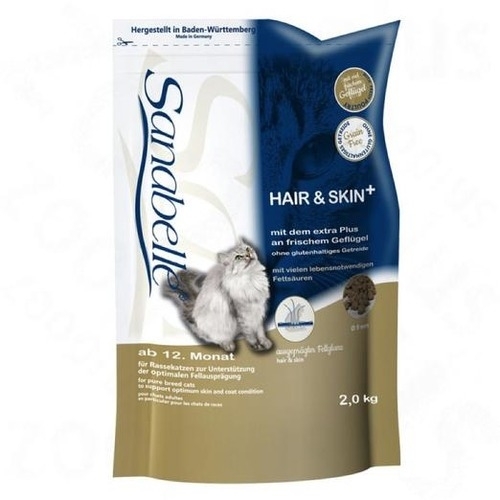 Has vitamins and trace elements, with rich oil & fats additionally support the skin and coat.? Sanabelle Hair & Skin promotes the pliability and glow of skin and fur, thus supporting your cat's elegant look. This is accomplished with a special combination of proteins and fats: an especially high-grade salmon meal carrying a high content of essential fatty acids (omega-3 fats) in combination with a variety of valuable animal proteins and fats. 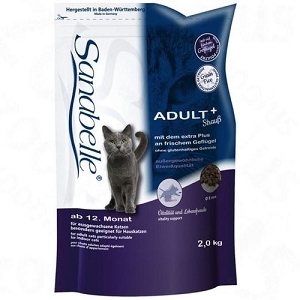 for cats to support optimal nice, shiny fur.